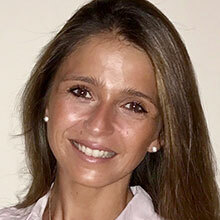 Alexia Sibony is the Director of Clinical Research, Quality, and Innovation at BewellConnect Corp. Often proclaimed the PT-Geek, she has leveraged her expertise to improve quality of care as a physical therapist in her daily practice but also as a quality consultant to enhance quality processes and risk management in different medical institutions in France and Monaco. Deeply engaged in women’s in tech initiatives around the world, Alexia is doing her utmost to further medical innovation to improve care quality in patients’ pathways. She is an active member of various associations in France, Monaco, and Boston aiming to promote equality, innovation and quality of care. Alexia moved from France to Boston two years ago to join BewellConnect Corporation where she played a prominent scientific role in designing mobile apps that have demonstrated strong improvement in Rehabilitation and Women’s Health. BewellConnect Corp is the US subsidiary of Visiomed Group, a French digital health company. As a technology pioneer in connected health putting patient at the center, BewellConnect is providing an eco-system of smart health devices and a unique end-to-end health platform providing a complete medical monitoring via multiple gateways.